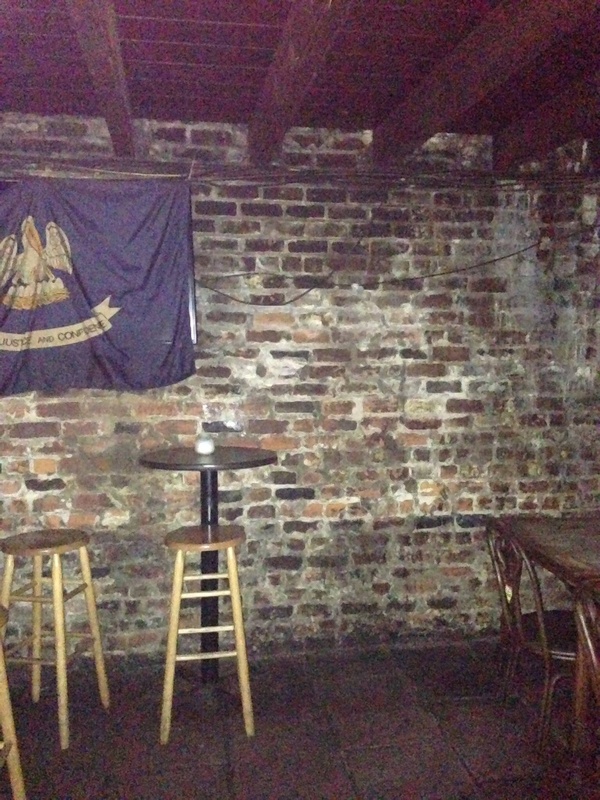 Jean Lafitte himself is said to haunt this bar, once the famed privateer’s actual blacksmith shop. The governor made every effort to shut down Lafitte’s illegal smuggling business, perhaps because of the affair Lafitte was having with the governor’s wife. 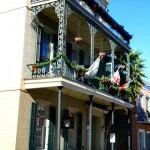 When Lafitte moved his business to the high seas, pirate history was made. Jean Lafitte has been seen on the premises, and some say they have noticed eyes that look very like Lafitte’s watching them from the fireplace grate. 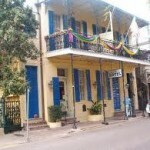 A woman’s apparition also has been seen here, and some say it could be famed Voodoo priestess Marie Laveau. Last summer my husband and I ducked into Lafitte’s Blacksmith Shop around lunch time to get out of a sudden rain storm. We had been there the night before in the rear piano area and had enjoyed such a fun time we thought it would be nice to see what that area looked like in the daylight (the place is only lit by candlelight – no electric light fixtures). We jokingly laughed about all of the people the night before who had sat there hoping (to no avail) to see Jean Lafitte who supposedly sometimes appears on the rear wall. No one had seen anything at all like that the night before. We did, however, note a few lighter colored bricks in a pattern on the back wall that if you squinted (& were drunk enough!) you might be able to kind of say slightly resembled the vague form of a face…we just assumed it was this lighter area that people with over active imaginations had been “seeing” and claiming was Lafitte all these years. Anyway, on this new daylight visit of ours, we sat down on a wooden bench in a back corner near the men’s restroom, facing the rear brick wall, the piano being a little to the left in front of us. On the other side of the room to the left of us was an old wooden door which I assumed went out to a patio, which was empty. I noticed the door had a padlock hanging from it. Anyway, we’d only been there about 15 minutes or so, when my romantic husband decided to take the opportunity to lean over and plant a big kiss on me (it was our anniversary, after all!). He was facing the rear wall while I was facing toward the patio door. Only a moment after the kiss ended, my eyes still shut, I suddenly heard my husband very calmly exclaim “I just saw him. The profile of Jean Lafitte just appeared out of that brick wall, turned and stared right at me, head on, then he just vanished. No kidding!” Immediately after hearing that, before I could even turn my head to look at the wall for myself, I opened my eyes only to see the patio door with the padlock on it open all by itself and then slam shut – with a noise loud enough to cause both of us to nearly jump right out of our seats! We both kind of sat there in shock and disbelief – then I asked hubby if perhaps he had mistakenly taken that lighter colored brick formation on the wall for Lafitte’s face. He just said “Nope, there’s no way! Even though he was like a thick grayish mist, he was as clear as day to me – I could even see all the details like his mustache and hat.” According to my husband, The apparition only appeared from the waist up – and looked quite similar to the drawing of Lafitte the business has up on one of their walls. According to him, the “profile” was facing to the right (mens room direction), then slowly turned to face straight forward looking right at my husband. He said the face didn’t give any kind of noticeable expression, it just stared him in the eyes, then disappeared. Now, before you assume we were drunk or it was just the imagination of some impressionable kids, let me tell you that we were only on our first drink of the day, we are both in our 50s and hubby is an airline pilot with over 20 years of military experience. He is NOT the type to indulge in crazy flights of fancy or strange imaginings. I have no idea why Lafitte only showed himself to my husband and not to me – perhaps the fact that my husband’s last last fighter squadron was the “Jolly Rogers” with a skull & crossbones as it’s mascot had something to do with it? Maybe because of that, Lafitte may have felt as though he had some kind of bond in common with my husband. Regardless, whatever the reason, the whole thing certainly made for a definitely interesting and memorable experience!